Expert Heating System Evaluation and Consultation, and a Detailed Written Proposal Specific To YOUR Needs – FREE! Since several industry studies revealed that well over 60% of new heating systems are not installed properly, it is important to trust the highly trained professionals at Air McCall to properly assess your heating system requirements. We will never use “high pressure” tactics to try to sell you a heating system. We will be a true “partner” helping assess the heating system that is best for you. We promise that you will be impressed with our professionalism, expertise, and how we show that we truly care about YOU and doing what is best for you, not us. Air McCall technicians are specialists with Gas Furnaces and Oil Furnaces. In fact, Air McCall is one of the few HVAC Contractors licensed to install, service and repair Gas Furnaces and Oil Furnaces. As a Carrier Factory Authorized Dealer, we partner with the leading name in the industry, offering a wide range of state-of-the-art solutions to year-round temperature control. If your furnace is over 25 years old, it has provided sufficient service and is most likely at the end of its life. While it may continue to operate, you are probably not enjoying peak comfort or energy efficiency. It is time to consider the many conveniences, rewards, and sophisticated features of a modern heating system. According to the Department of Housing and Urban Development, the typical life of a gas-fired furnace is estimated at 18 years. The lifespan of the average heat pump is around 10 to 15 years. Modern, high-efficiency heat pumps can last longer, and provide 30-40% savings over the service life. Our licensed technicians provide proper installation and will guide you in the correct use of your system. According to the EPA, over 90% of installations suffer from energy wasting and discomfort-causing mistakes. The Air McCall approach is quality first, ensuring that your new equipment operates at peak performance, saving money on monthly utility bills and providing reliable comfort year after year. Taking the necessary steps to properly size and solve any pre-existing problems greatly improves air quality and eliminates fluctuating temperatures. If you are in the market for top-of-the-line heating, Carrier has the answer. When it comes to temperature control, Carrier has every item on your wish list covered. By pairing state-of-the-art technology with timeless values, Carrier products guarantee the most dependable, cost-effective comfort on the market today. The Infinity Series achieves up to 98.5% AFUE through variable-speed blower technology and a two-stage gas valve. Operating primarily in low-stage, these units reduce temperature swings, save energy, and are ENERGY STAR qualified in all sizes. Also ENERGY STAR rated, the Performance Series ensures quiet, rewarding comfort, and offers AFUE ratings up to 96.7%. The Comfort Series, with an AFUE up to 95.5%, offers pilot-free ignition, fully insulated cabinet, and economical heating at its best. 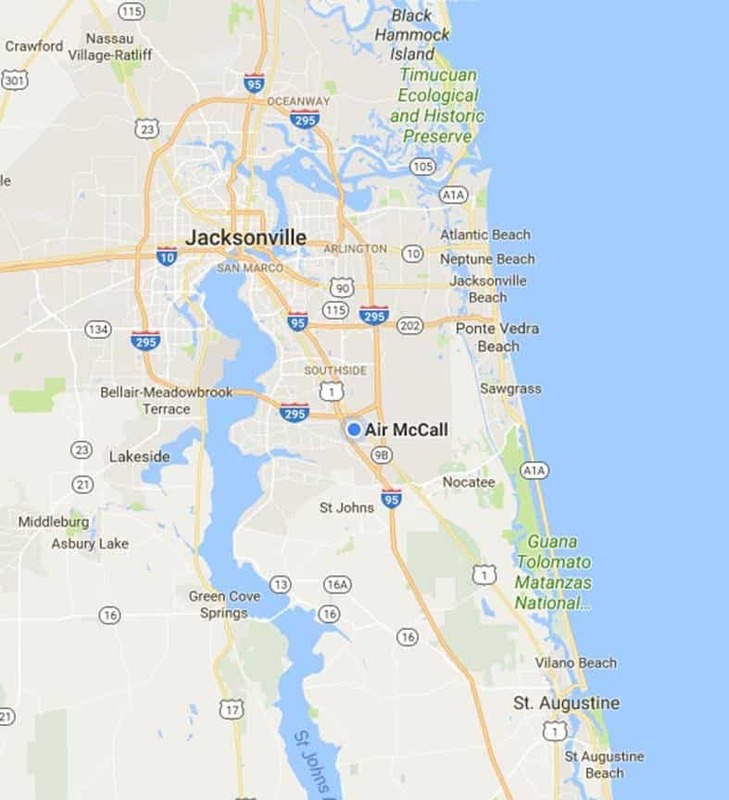 Heat Pump Installation you can trust in Jacksonville! A heat pump provides both heating and cooling capabilities in one convenient system. Like your refrigerator, heat pumps move heat from a cool space to a warm space. They transfer heat rather than generate it, providing perfect year-round temperature control for as little as a quarter of the cost of operating conventional heating or cooling systems. 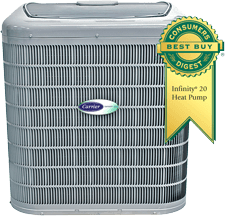 The Carrier Infinity Series Heat Pump with Greenspeed Intelligence offers whisper-quiet heating and cooling, achieving up to 20.5 SEER and 13 HSPF. It is important to find a HVAC unit that will heat your home quickly and efficiently. At Air McCall we know how to evaluate your home, helping you choose the right heating equipment to satisfy all of your comfort needs and performance expectations. By matching the unit’s specifications to your requirements, installing it properly, and providing yearly maintenance, the professionals from Air McCall ensure reliable heating, not only today, but for years to come. We offer Wells Fargo, GE and Synchrony financing, two-year warranty on new installation, and free one year preventative maintenance tune-up if you tell us how we did with a review on Google. When you call Air McCall to design your new heating system, count on the best of everything.